Two nights after pulling off the second-lowest successful defence in the IPL, Sunrisers Hyderabad defended 132 to snap Kings XI Punjab's four-match winning streak without Billy Stanlake and Bhuvneshwar Kumar. Sunrisers could pull off another coup seemed improbable when Ankit Rajpoot's 5 for 14 - the best figures in IPL 2018 and the sixth best overall - pinned Sunrisers down to 132 for 6. It seemed as improbable when KL Rahul and Chris Gayle, the most prolific opening pair this season, raised their fourth fifty-plus stand in as many innings opening together. Enter Rashid Khan, the No.1 T20 bowler right now, and the experienced Shakib Al Hasan. They ran rings around Kings XI's line-up and threatened both edges. Sandeep Sharma did his bit with knuckle balls. And, just like that, there was a slip breathing down the batsman's neck. Just like that, Kings XI's chase unravelled: from 55 for 0 they imploded to 101 for 9. Mujeeb Ur Rahman then hacked and reverse-swept his way to 10 off five balls - his first runs in T20 cricket - and reduced the equation to 15 off the last over. The first ball of that from Basil Thampi was a sharp inswinging yorker, which thudded into the pads of Mujeeb, who sneaked in a leg bye. 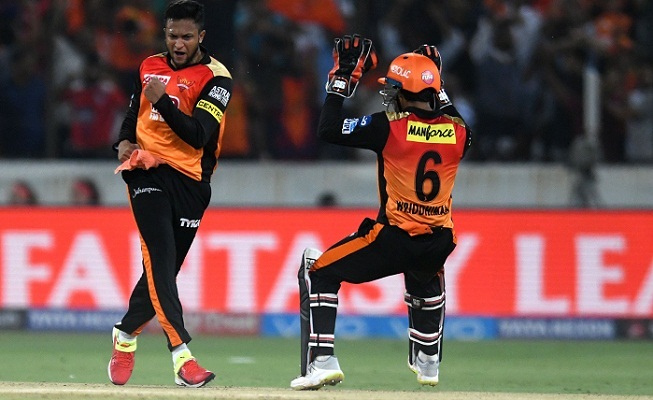 Thampi then nailed the base of Rajpoot's middle stump to cap Sunrisers' comeback and move them to second on the points table. The ball was bursting off a length and zipping through to the keeper in Hyderabad. The conditions here might have reminded Rajpoot of his stint in South Africa earlier this year as a net bowler. He bounced out Kane Williamson and Shikhar Dhawan in the Powerplay before returning in the last over of the innings to floor Manish Pandey's middle stump with an inch-perfect yorker from wide of the crease. Rajpoot had shown signs of his hit-the-deck bustle against Delhi Daredevils on Monday, when he claimed 4-0-23-2 in an uninterrupted four-over spell with the new ball. But this pitch had more grass and offered more bounce. Rajpoot exploited it in his first over and had Williamson splicing a catch to mid-off for a duck. This was the reason why he was picked ahead of the more experienced Mohit Sharma. Barinder Sran, at the other end, also found extra bounce but lacked enough discipline. He had Shakib top-edging a cut to third man, but replays indicated that Sran's front foot had strayed. At that point, Shakib was on 0. Sran came close to a wicket on another occasion, when he had Pandey skewing one over mid-off. R Ashwin ran back but he could not cling on. Pandey had two more lives, but he could not break out of the funk. Ashwin and Mujeeb did not make his life easier with their bag of tricks. They kept batsmen guessing with offbreaks, legbreaks, googlies, carom balls, and front-of-the-hand sliders. Andrew Tye's knuckle balls ensured there was no escape against him either. The three bowlers had combined figures of 12-0-79-1. The 52-run partnership between Shakib Al Hasan and Pandey, which came at just 5.88 runs an over, was the slowest stand of 50 or more this season. Pandey's fifty, off 48 balls, was the slowest this season, but it hauled Sunrisers past 130 and gave their bowlers a sniff. A sniff was all that they needed. Rahul and Gayle had just seen off Sandeep's opening spell and shaved 53 runs off the target in seven overs. Rashid, though, provided the breakthrough in his first over, with a perfectly pitched legbreak, which turned just enough to beat the outside edge and clatter into off stump. Rahul did not read it: he was playing inside the line, searching for a googly. In the next over, Thampi rushed Gayle for pace and pouched a return catch. Two set batsmen gone in four balls. Karun Nair and Mayank Agarwal nervously knocked the ball into the gaps to leave Kings XI needing 56 off 48 balls. Then, instead of continuing to find the gaps, Agarwal hared down the track to Shakib, but did not meet the pitch of the ball and holed out to wide long-on. That set in motion a terminal collapse. Mujeeb gave Sunrisers a late scare but the spinners and Sandeep had done enough to help them survive it. Rashid and Shakib combined for figures of 7-0-37-5. Then there was the reserve quick Thampi providing the finishing touches and highlighting the depth in the attack. He had been named the emerging player of the year last season, but could not break into the team in 2018 until Stanlake and Bhuvneshwar sustained injuries. That's how good this attack is.